Unit charges phone in 'under minute' Jump to media player The BBC has been given an exclusive look at a new kind of battery charger, that can recharge a modern smartphone in less time than it takes to boil a kettle. What is CES, and why does it matter? Jump to media player Why does everyone in the technology business descend on Las Vegas at the beginning of January every year? Electric roller skates 'save time' Jump to media player A French inventor has unveiled what he is claiming is a "personal transportation system" at the Consumer Electronics show in Las Vegas. CES 2015: Key trends to look out for Jump to media player Shawn DuBravac, chief economist of the Consumer Electronics Association, says new gadgets that digitise the world are set to change the way we live. Buzzing bracelet chats without screen Jump to media player A device called Feeltact promises to let users communicate subtly by wristband. T-shirt checks your vital statistics Jump to media player French company Cityzen Sciences has developed a smart t-shirt, that measures statistics like your heart rate. Digital tag helps you locate items Jump to media player Michelle Fleury takes a look at a new kind of GPS-enabled tagging system, designed to help you find lost items. CES 2015: Time for ankle tech? Jump to media player Mybiody Balance product takes your vital statistics through a device that attaches on to your ankle. Can gadget count calories digested? Jump to media player George Mikaberidze defends his controversial GoBe fitness band which it is claimed can count the calories digested by the wearer's body. The BBC has been given an exclusive look at a new kind of battery charger that can recharge a modern smartphone in less time than it takes to boil a kettle. The technology has been developed by Israeli start-up Storedot. 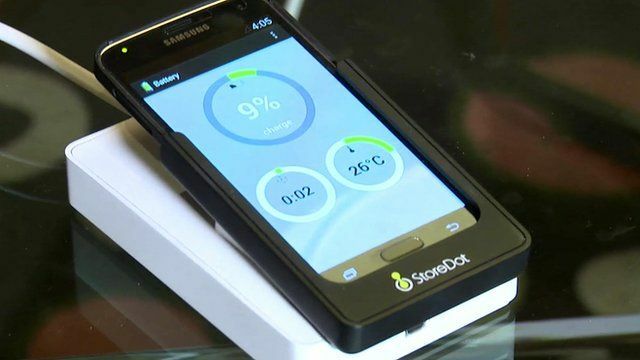 The company's chief executive, Doron Myersdorf, showed the BBC's Leo Kelion how a smartphone could be recharged from being nearly out-of-juice to full capacity in a short space of time. Go to next video: What is CES, and why does it matter?